Just how popular is the Internet of Things? Popular enough for “smart home” to see a fourfold increase in searches on Yelp over a two-year period. Yelp shared its third economic outlook program on May 15, using site statistics to gauge growth across the U.S. The latest dataset points to “enormous” growth in home automation business in major metro areas during the first three months of 2018. 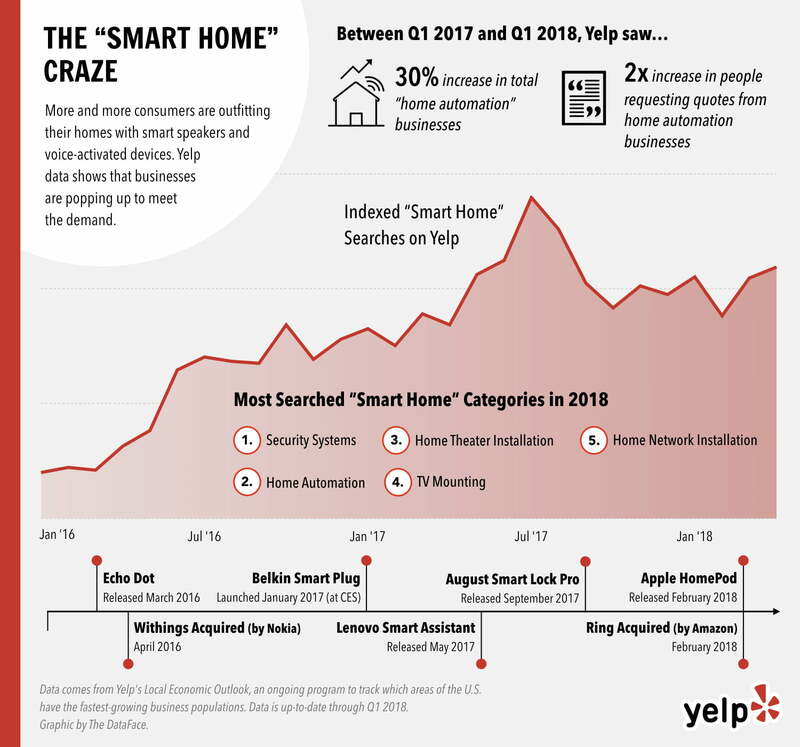 The trend makes smart home automation one of Yelp’s fastest growing categories in Home and Local. While Yelp’s restaurant searches are among the platform’s most well-known features, the home and local category is the platform’s fastest growing by revenue, prompting Yelp to focus its quarterly Local Economic Outlook report on the category. Nearly 2 million people used Yelp’s Request a Quote in the home and local service-based business category in the first three months of 2018 alone. As the number of searches for smart home increased, so did the number of businesses catering to designing those connected homes. According to Yelp, there are 30 percent more business listings in the home automation and security categories compared to a year ago. Quote requests doubled from the previous year. “The rapid growth and industry response suggests that the rise of smart homes may not be a flash in the pan and has extended beyond the early adopter community,” wrote Peter Weir, a data scientist at Yelp. While the industry as a whole is seeing growth, Yelp says the trend is strongest among cities with the healthiest economies. The company’s quarterly report also looks at 50 US cities, chosen by investment in local businesses, and uses Yelp page views to rank business growth in each of those cities. Austin, Texas topped Yelp’s list for the first quarter. Home and local services as a category created the most growth for the city based on the number of new business listings on Yelp. Philadelphia dropped to the end of the list of 50 cities — a change that could be tied to the city’s higher-than-average poverty rate (25.7 percent), Yelp suggests. The data comes from analyzing the number of new business listings, balanced with any business closures, on Yelp between January and March. That data is analyzed in 50 cities across Yelp’s top ten categories.